BOCA RATON, Fla. (April 28, 2014) – Continuing the global glow of the 44th Annual Earth Day, Sklar Furnishings (Sklarfurnishings.com) announces its hosting of its first “ALL THAT’S GREEN” SUNDAY, a free community event to share the advantages of embracing and enjoying a “natural” eco-smart lifestyle while benefiting Habitat for Humanity of South Palm Beach County on May 18th from 1 p.m. to 4 p.m. at its 22,000–square–foot contemporary furniture showroom and design center. An industry leader in green advocacy that forges furniture alliances around the globe with designers and manufacturers that share its strong commitment to the environment, Sklar Furnishings is bringing Tesla, Environmental Strategist Yalmaz Siddiqui of Office Depot, Inc., Shred Trust, eBikes On Demandpowered by the Electric Bike Store, Organic Cellar Plus, American Fine Wine Competition, Gourmet Truck Expo (serving up plant-based and organic foods), Eat The Truth with Coco Frey, Cristino Fine Jewelry, and Habitat For Humanity’s ReStores to join its team of credentialed home and office designers and space planners to help drive the year ‘round message of building a greater eco-community. In addition to having the opportunity to tour its variety of custom furniture lines that are invested in heavily reducing the environmental impact of its operations and use of reclaimed natural materials, event-goers will enjoy a host of green lifestyle showcases, demos, ebike test drives, healthy food samplings, organic and sustainable wine tastings, energy efficiency seminars, onsite estate jewelry re-sales, live entertainment by vocalist Kendra Erika, and special offers, giveaways and chances-to-win. 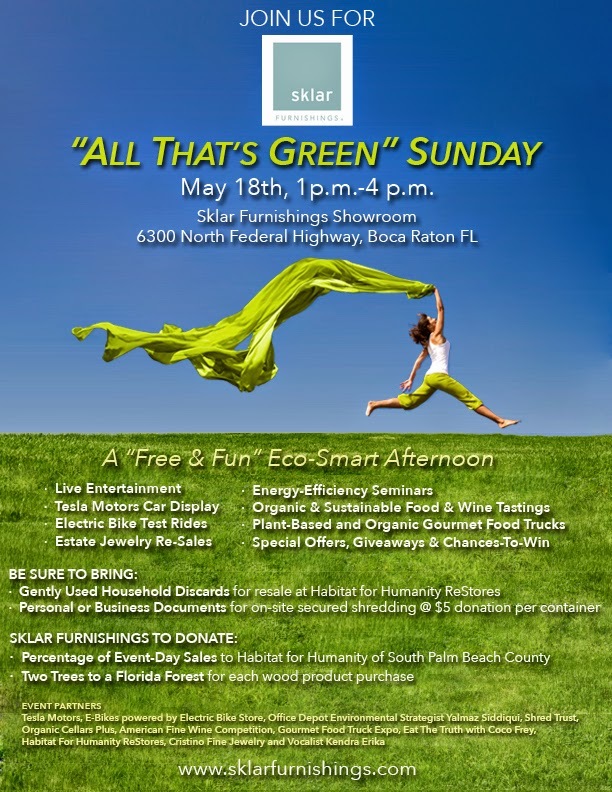 While Sklar will donate a percentage of sales on event day to Habitat for Humanity of South PBC plus two trees to a Florida forest for each purchase of a wood product, event-goers also have the opportunity to do their part in “repurposing, recycling and shredding” for a cause. To help raise vital funds for Habitat For Humanity, Sklar encourages the community do some serious “Spring Cleaning” and then donate their gently used household discards on event day for resale at Habitat for Humanity ReStores (www.bocadelrayboynton.habitatrestores.org). They can also bring their old tax and other personal documents to be securely shredded onsite by Shred Trust— for a $5 donation per container — during event hours. Scheduling pick-ups of large appliances, furniture, doors, hurricane shutters and more can also be made at the Habitat for Humanity tent. “Even though Earth Day comes just once a year, it is critical that environmental awareness and advocacy be a continuous all-year mission,” adds Sklar Co-Owner Rick Howard, who is also president of the North American Home Furnishings Association that champions the independent home furnishings retailer — the nation’s largest organization devoted specifically to the needs and interests of home furnishings retailers, with more than 1,800 members representing more than 7,000 storefronts across all 50 states and several foreign countries. Sklar’s green commitment started with joining the Sustainable Furnishings Council, a nonprofit balance coalition of industry players founded at High Point, NC that promotes sustainable practices among manufacturers, retailers, and consumers alike. Thus, Sklar does its part both in business operations of being as eco-efficient as possible and community initiatives such as ‘All That’s Green’ Sunday to raise awareness and encourage reductions in carbon emission, waste stream pollutants, un-recyclable content and primary materials from unsustainable sources. She reported that a significant array of Sklar vendors are also responsible stewards of the planet, as event-goers will find as they tour through galleries featuring American Leather, Huppé, Jesse Furniture, Tonelli Design, Copeland Furniture, Phillips Furniture. All of Sklar’s leather line tanneries now use the eco-friendly method, all wood manufacturers use water-based stains, and several vendors offer selections of organic cottons, and several of its rug vendors use scraps from other industries (i.e. silk tie remnants, nylon hosiery wastes). There are plentiful design applications in glass – from tabletops and shelving to art and accessories – that in itself is “green”. Since Sklar Furnishings opened its doors by the entrepreneurial husband and wife team in November 2002, the only independent furniture showroom of its kind in the region has had a strong partnership with Habitat for Humanity that provides “simple, decent, and affordable” housing for low-income families. Sklar donates thousands of dollars in merchandise to the organization that in turn is sold in ReStores, thus being recognized as a recipient of the “I Gave at the House” Award for six consecutive years. With Rick Howard serving on the Habitat for Humanity board of directors, Sklar’s support escalated to underwriting the construction of its first Habitat For Humanity home that was completed and dedicated in October 2013. “Helping to not just provide shelter, but also instill pride of ownership and a true ‘sense of community’ to those working hard to become first-time homeowners is both gratifying and inspiring as our entire team looks forward to beginning efforts for a second Habitat For Humanity home,” noted Pat Howard, who with Rick Howard will be honored on May 22nd as the 2014 Small Business Leaders of the Year by the Greater Boca Raton Chamberfor their professionalism, business leadership, entrepreneurism and community “give back”. Open seven days a week with showroom hours: Monday-Saturday, 10 a.m. to 6 p.m.; Sundays 12 Noon to 6 p.m., Sklar Furnishings is located at 6300 North Federal Highway, Boca Raton, FL 33487. For more information on its furniture and accessory lines or the “All That’s Green” Sunday community event, call (561) 862-0800.